This post outlines new features from HubSpot, an online marketing software company that powers inbound marketing campaigns. As a Certified HubSpot Partner and Gold Tier VAR, PR 20/20 got a sneak peek of the tools, so we wanted to share with you what's possible as they roll out to all users. On Tuesday, May 15, HubSpot released two major updates to its marketing software — a new Email Manager and an updated leads database, Contacts. Both of these tools provide users with an improved front-end design, as well as a variety of enhancements that better support the ability to gather, maintain and communicate with customers, leads and subscribers. Following is an overview of the updates made to HubSpot’s online portal, key features users should take note of, and highlights on how to leverage these improvements to achieve sales and marketing goals. Replacing the original “Leads” section in HubSpot, Contacts is a centralized location to access and maintain contact information for individuals in your database. At first glance, the most noticeable difference is the design of the user interface. The main page is organized chronologically, and includes each contact’s name, Twitter image (if available), when they were added to the database and the form name associated with their most recent conversion. All tools associated with contact management, email and lists are easily accessible in the right-hand column. The database is searchable, and can also be segmented by existing lists. Contact profiles, or individual lead records, now include basic and custom contact information, a history of that person’s engagement with your site and an overview of all email history and subscriptions. There is also a running history of edits made to each contact that can be used by team members to review all updates made to a contact’s record. 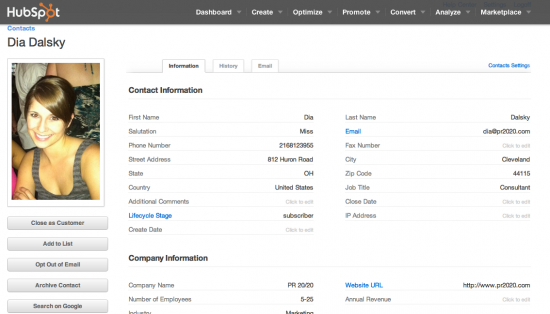 “Add New Contact” enables users to add a single lead to the database. Previously, leads could only be updated through completion of an online form, or uploaded as a CSV file. This feature can be used to add people from a networking event or sales call that have not engaged the brand directly through a form. Field customization offers users the ability to create custom fields in contact information, such as “Professional Organization,” “Product” or another field relevant to your business. These fields can be used to create lists and personalize emails. The email tab offers engagement metrics of emails a contact has received and management of multiple subscriptions. Users can now customize and review contact subscription options, such as opting out of promotional emails but receiving blog updates. Additionally, contacts will be prompted with the option to manage their subscriptions. “Share Contact” is a great new feature to better integrate marketing and sales. 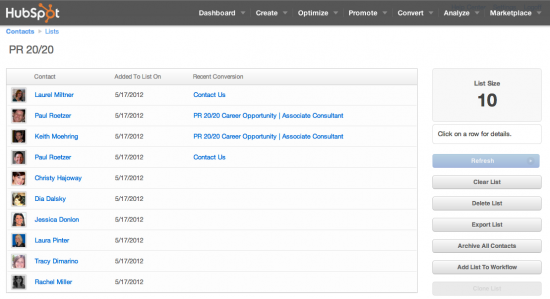 The public contact link can be shared with members of a sales team who do not have full access to the HubSpot portal. To keep sensitive information private, links can only be viewed by individuals with authorized company email addresses. The new email system offers eight customizable templates that reflect best practices in email marketing. Users can customize the templates by logo, color scheme, content, body image and included social media profiles. 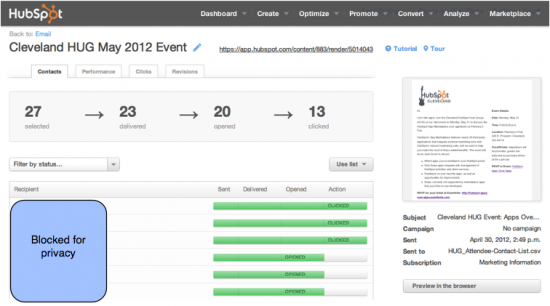 Performance metrics are one of the most important enhancements in the new email tool. The dashboard includes a complete list of sent, drafted and scheduled emails, including key metrics on delivery and engagement. Data can be reviewed through high-level performance charts, as well as individual recipient engagement metrics (e.g. sent, delivered, opened, clicked), total clicks to embedded links and a history of email revisions. Similar to options available in the old Email Manager tool, emails are automatically created in a rich text format, but can also be edited in HTML. Also, emails can be cloned, or duplicated, to repeat a one-time campaign. After an email is cloned, the content and recipient list can be edited to reflect any needed changes. Sender and recipient customizations have been enhanced, including associated campaigns. 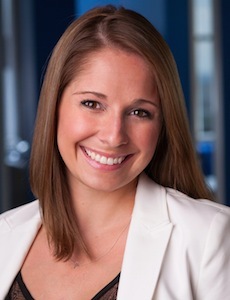 At minimum, HubSpot recommends setting up campaign groups for company announcements/news and content resources. Campaigns can be analyzed as a whole or by individual recipients and their engagement with the email. Emails can be created in web page versions that include on-page optimization fields for page title, URL and meta description. When selecting a recipients, “block” lists can be created. This feature allows users to upload a full list of recipients, but block a subsection of those by creating a second list of contacts to be removed from the first. Note: As of last Tuesday, all new HubSpot customers will receive the updated tools in their portal. For existing customers, the migration will occur over the next several months. Because there are existing integrations in place with external tools, HubSpot is working with customers to ensure a seamless transfer without losing functionality or information. For more information, watch last week's archived webinar on HubSpot TV— Partner Demo of New HubSpot Email & Contacts Tools. You can also check out the HubSpot Email Tutorial on how to create and send emails in the new system. On Thursday, May 24, I will be a guest HubSpot Partner participating in a webinar to discuss the new email and database tools. During the webinar, several partners will offer feedback on their experiences using the beta tool, as well as how it integrates with customer services. Stay tuned for a link to the webinar registration. The updated email and contacts tools are two of the more significant updates made to HubSpot’s marketing software in the recent past. How do you plan to utilize these updates and new features? What improvements do you think will benefit your company the most?